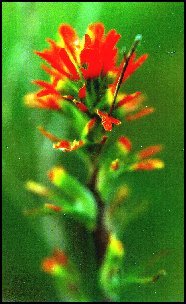 Indian paintbrush is one of the few truly orange flowers. Oddly enough, it's not really the flowers that are orange, but the leaf-like bracts below the flowers. The actual tube-like flowers are not particularly showy. Most of the leaves are close to the base of the plant, with a 1-2 foot spike supporting the flower. The plant seems to prefer moist gravelly areas and soils high of limestone origin. The only other common orange roadside flower is hawkweed. A genus of both native and exotic species, the dozen (or more) hawkweed species are difficult to distinguish but as a genus are easy to recognize. There are few orange flowers, especially along roadsides. 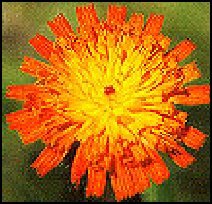 Hawkweeds look like orange dandelions on slender stalks, but there is no milky sap. The intensity of orange varies, some are even yellow.